A self-taught artist, Giulio started exploring art as a child using pastels and pencils to interpret the world. A passion that later hit into his father’s work and led to a cooperation in managing of the Cibrèo and the Teatro del Sale, where the transformation of the matter and the search for beauty and for new ways of expression are all part of the same momentum. In his artistic project “Città volanti” (Flying cities) the city becomes the narrative framework that takes up ideal forms – a hearth, a fish – and is permeated by the vital trail of water that surrounds it like a snake. Small hamlets that resemble Florence and the neighbourhood of Sant’Ambrogio, with red roofs aligned in rows like people walking hand in hand, mirror each other and create a ‘world above and a world below’ and fly upon blue skies. The narration of this vision takes shape and body through the technique based on acrylic paints and large painted backgrounds in thousands of different shades, as in children games. The work of Giulio has been present for years in the posters of the Teatro del Sale, the “Circo-lo” lead by Maria Cassi, the actress, author, director and wife of Fabio Picchi. In these posters Giulio experiments with a mixed technique that alternates hand drawing and digital art and creates a new style where the images freely emerge on flat, single colour backgrounds, thus generating a timeless, surreal and intimate feeling. 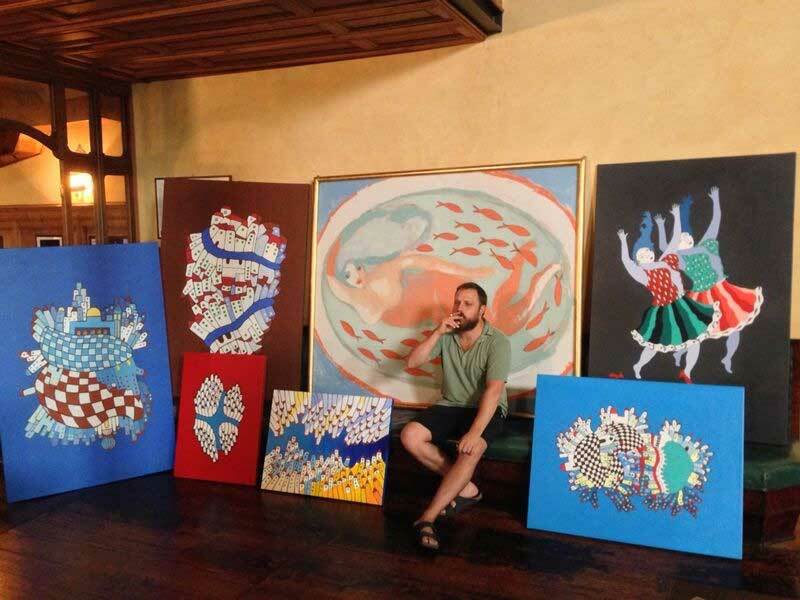 His work is often on the go: in 2014, thanks to a suggestion by the great Swiss clown Dimitri and his wife Giulia, he was invited to take part in an exhibition organised by Micaela Grunder in the Swiss gallery Kunst-und KulturZentrum Littau-Luzern. In 2015 he drew the covers for the magazine “Nuovi Argomenti” published by Mondadori and is now cooperating with several groups and companies in graphic and illustration projects.